Found 13 file extension associations related to MasterCook and 13 file formats developed specifically for use with MasterCook. 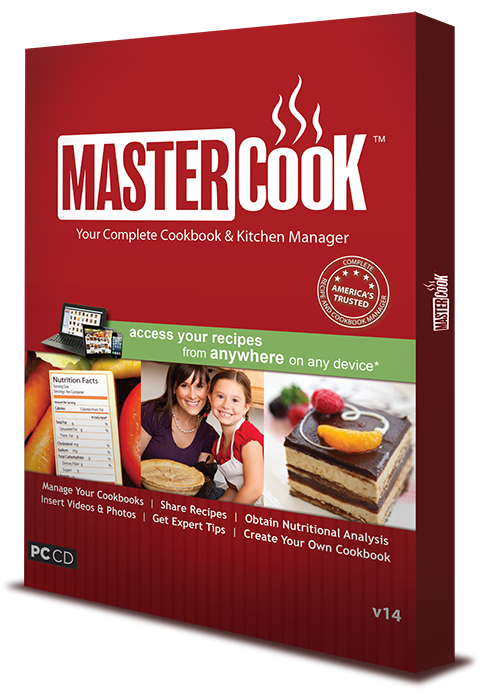 MasterCook is electronic form of cookbook for Microsoft Windows. 5,000-plus easy-to-follow recipes, you'll get your fill of mouth-watering appetizers, delicious entrees, and tantalizing desserts. Compile all of your favorite recipes in one convenient, central place. You can add your own notes and photos, print out recipes to share with friends, or even send them via email. Keep track of fat, calories, sodium, cholesterol, and more with the instant nutritional analysis. You can even accommodate special dietary needs for vegetarians and diabetics and those with hypertension, food allergies, and low-carb requirements. Now menu planning is as easy as clicking your mouse--whether you plan one meal or one week in advance. Recipe scaling will help you instantly adjust recipes to fit your family and entertainment needs. Best of all, the program automatically generates shopping lists for you to print out or download to your Pocket PC and Palm OS handhelds. Never forget an ingredient again--professional chefs and culinary experts give you expanded information on cooking methods and fundamentals, time-saving tips, and even insight into special techniques in step-by-step instructional videos. Special bonus: the software now includes recipes from the "Food for Fifty & On" cooking textbook of culinary fundamentals. If you need more information please contact the developers of MasterCook (ValuSoft), or check out their product website.